Jim Davenport, a longtime fixture with the San Francisco Giants organization as a player, coach, manager, scout, and executive, passed away Thursday evening according to an announcement made by Barry Bonds. He was 82. Davenport started in the major leagues with the Giants in 1958, playing primarily third base during his 13-year career, retiring after the 1970 season. In 1985, he served as manager of the Giants, posting a record of 56-88 before losing his job to Roger Craig during the last month of the season. 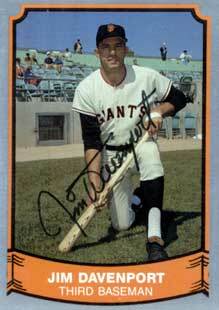 Joe Amalfitano, Davenport’s former teammate on the Giants and close friend, deftly described Davenport’s deep roots with the Giants organization. "Jimmy's a pillar of that organization," Amalfitano said to MLB.com in 2014. "If you cut his veins, red wouldn't come out. It would be orange and black. I truly believe that."